In the far reaches of the sandy desert, between hostile canyons and endless dunes you can find the Gnoll Enclave. This settlement has been built over several flat-topped desert mountains linked each other by bridges made of stone and bones. Led by a tyrannical packmaster the desert gnolls are fierce foes, backed up by a cabal of shamans and spirit callers. Can be assembled in a 17x22 inches map, in different configurations! Gnoll Enclave presents four color maps you can arrange as you wish to form a larger map. You can event print more than one copy of the same map in order to obtain a bigger map. On this plateau you can find the most basic gnoll settlement: dozen of gigantic huts made of hides and bones, mostly used for sleeping and to take shelter during the night or during the frequent sandstorms. A single well provides enough fresh water for the gnolls living there. Standard features of every gnoll settlement are the hyena fences, scattered among the huts. Several dump pits have been excavated there and there. The cabal of shamans erected a couple of totems and designated two spots as sacred ground for spirit calling. This is where the gnolls keep their slaves. Mostly they maraud the desert caravans and then use the slaves for sacrifices or sell them to unscrupulous human bandits. The slave pen is built around a massive dragon skeleton dead from ages. The gnolls mount constant guard over the slave pen, looking through peeping holes made in the four corner huts. Hyenas also help the gnoll guards to survey the complex. This massive structure is almost big as the temple. It houses the mighty gnoll packmaster along with his bodyguards and concubines. The packmaster hides a great treasure looted in many years of activity over the desert. The packmaster’s bedroom is full of looted furniture and treasure. A smaller building houses the elite troop as well as a packmaster’s personal larder full of fine spirits. The Colorprints product line offers you full color fantasy maps for using in your adventures and campaigns. 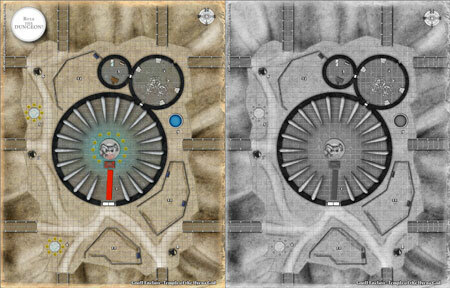 For each map you get a color version and a grayscale version. The maps feature high resolution, allowing you to obtain a great print quality. Each map offers you a degree of customization, using the pdf technology at its best. A button (which will not be printed) on each map allows you to turn on and off the grid, eliminate the room numbers, get the walls filled, don’t show doors and furniture and many other options, depending on the kind of map. 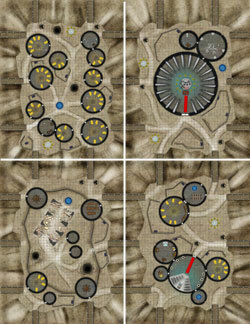 An RPG Resource Review: In this mapset, a gnoll enclave s ..